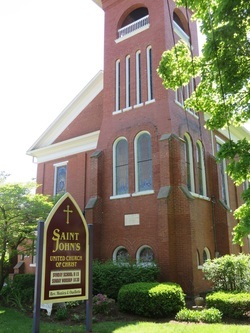 The Zion Lutheran Church of Boalsburg originated in 1825 as a co-joined congregation with St. John’s Reformed church. The two groups split during the Civil war and the present building was constructed in 1868. It sits on an acre and a half lot within which are also the cemetery and the Memorial Day and Armed Forces monuments. The front of the church faces Old Boalsburg Road, with the cemetery on the west side. The building is bordered on the right by N Church Street and in the back by Boal Avenue (Route 322). The building is composed primarily of English bond brick with the exception is the lower half the front facade which is laid in the fancier American running bond style. This is typical of brick buildings of the era and adds to the aesthetic value of the church. There are three bays in the symmetric front façade comprised of a central double door flanked by blank windows. There are three high and narrow stained glass windows above the three ground level bays. The cemetery (west) side of the building has an unsymmetrical flat façade with five sash windows that are double paned with stained glass. The N Church Street side is neither flat nor symmetrical but has a three dimensional appearance. There are four lower windows, double paned in the same manner as the front and cemetery side, with four high and narrow stained glass windows. The rightmost part of the facade juts out toward the street and resembles a separate addition to the original edifice. This section was added on in 1959 and now contains an elevator and a second entrance door. There are two windows to the left of the door and three more above that are different from the other windows of the church having two four over four pane sashes. The entrance door leads into the first floor narthex (lobby) and hallway that is flanked by a kitchen and office and ends in a large Sunday school room. Dual staircases lead from the narthex and open into the to the second floor nave. The two sets of stairs lie on either side of the balcony section in the back of the nave. The nave is filled with pews on either side of a central walkway from the altar all the way to the back. There are twelve stained glass windows: three in the back, four on the right‑hand side, and five on the left‑hand side. There are no windows in the front beyond the altar and choir section, and the reason for lack of symmetry is that the front right‑hand comer of the room contains the elevator and a secondary staircase. The front of the nave contains the organ pipes, the chancel, and the choir section with the organ consol in front. Four chandeliers are hung from the ceiling and there is gold decorative stenciling around the circumference of the room about half a foot below the ceiling. A wood molding in the form of three big arches that stretch across the width of the room at the rear hangs over the front part of the balcony.